I was replacing the newspapers in Peanuts' indoor potty spot when I came across this February article. 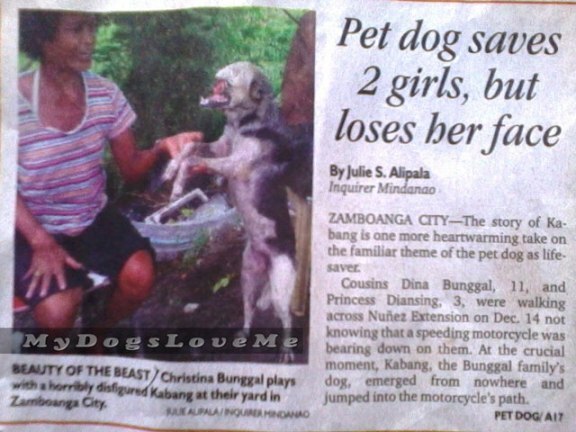 It's about a dog named Kabang (the locality's term for "spotty"), a female dog who saves the lives of two little girls. The girls had been crossing the street when Kabang leaped towards them before a motorcycle could hit the cousins. They stumbled but both of them were unharmed. This article made national headlines. It was definitely worth reading. Unfortunately, some of Kabang's facial bones were crushed that she lost her snout when she got stuck on the motorcycle's front wheel. The instant she was pulled off, she ran away from home. The family had taught that she was gone for good but two weeks later, Kabang came back with a very different look. Nonetheless, the family was happy she went home to them. She is currently eating with the help of her paws. Kabang had found her forever home in the Bunggal family. They treated her as one of them even though they didn't have much to offer. When she was a puppy, she was fed with milk and porridge. For a family in poverty, providing for their dogs is a big deal. Yet they did, and for that I applaud them. Poor little Kabang. What a great thing she did for the two little girls. We're glad she went home where she's loved. That's a beautiful story. I hope she will be OK.
A bittersweet tale but at least with a loving ending. Kabang is a heroine for saving those girls and her family deserves to be called heroes too for taking such good care of her. What a wonderful dog, she deserves to be loved and cared for. What an incredible dog. I hope she gets tons of love. Thank you for your healing thoughts. We're getting my test results tomorrow...please keep your paws crossed! A remarkable story and heartwarming too. Hope this dog is well cared for for the rest of her days. That's one incredible and heroic dog. We sure hope she is well-cared for and loved for the rest of her life. That is an amazing story..and even more amazing that Kabang is okay and did not die. Her injuries so severe with the loss of all her upper jaw and facial snout..nose...wow...I hope that she is well taken care of the rest of her precious life. Kabang is a hero and her family is truly wonderful to stand by her despite their own hardship. 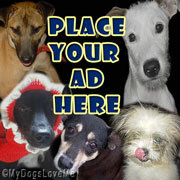 We send White Dog healing energy that this incredible pup mend and adapt to live a long happy life. We ask the Universe to bless this family for their kindness and compassion and love. That poor dog! What a hero, I sure hope she is okay! Wow, that is an amazing story! This is heartbreaking, but so amazing. Dogs are incredible creatures.